March 19, 2019, Toronto: Today in the House of Commons Minister of Finance Bill Morneau tabled the 2019 Federal Budget. Titled Investing in the Middle Class, the Budget is focused on improving affordability and employment opportunities through various measures including skills training and affordable housing initiatives. Musician, label owner, and music festival founder Miranda Mulholland emphasized the economic impact of the arts, and the need for urgent action to protect the careers of creators. The full Investing in the Middle Class Budget Plan 2019 is available on the Government of Canada website. Music Canada is a non-profit trade organization that represents the major record companies in Canada: Sony Music Entertainment Canada, Universal Music Canada and Warner Music Canada. Music Canada also works with some of the leading independent record labels and distributors, recording studios, live music venues, concert promoters, managers and artists in the promotion and development of the music cluster. Last Thursday, musician, label owner and music festival founder Miranda Mulholland appeared before the Standing Committee on Canadian Heritage’s study of remuneration models for artists and creative industries, where she shared her personal experience as an artist living in the Value Gap. Mulholland then stated that creators are storytellers and that the story she would tell them today had a beginning, a middle and that she hoped that she and the Committee members would write the end together. After outlining how she got her start in music, becoming a fiddle player as the digital revolution took off, Mulholland spoke about the Value Gap, and what it has meant to her career. Mulholland then referenced previous testimonies that the Committee has heard, from artists like Andrew Morrison of the JUNO-nominated group The Jerry Cans, and Music Canada President and CEO Graham Henderson, who both spoke of the disappearance of middle class artists. In the middle of her dynamic and authentic presentation, Mulholland proposed four immediately actionable solutions that Committee members could recommend to help improve the framework, which are captured in the video embedded below. Approaching the end of her story, Mulholland expressed hope that the Committee would help write the ending. Referencing the recent actions that lawmakers in Europe and the United States have taken to help close the Value Gap, Mulholland expressed hope that the Heritage and Industry Committees can work with artists like herself to fix the broken framework and update the laws to reflect artists’ day to day lives. “Each one would have an immediate effect. The first one, the radio royalty exemption, getting rid of that subsidy – and again, subsidizing – artists are subsidizing the big media conglomerates – that needs to stop. And if that ended, that money would be filtered through into artists pockets immediately. Same with sound recording … I just played with Alan Doyle on a new kids show that he’s writing the music for… if this was enacted and the sound recording wording was changed, as soon as that is played, I will get paid for my work – so that would help me immediately. The private copying – that would help immediately as well. Following the hearing, Committee members enthusiastically thanked and congratulated Mulholland for her concise and moving testimony. Full video of the September 20, 2018, Standing Committee on Canadian Heritage hearing is available on the House of Commons website. Music Canada joins our European counterparts in applauding the European Parliament for today’s historic vote on the European Copyright Directive. The vote is a vital step towards ensuring Europe’s creators are paid fairly when their work is consumed online, and provides a strong example for other governments to follow to support their own creators. “Congratulations to the European Parliament on today’s historic vote to create a framework for creativity to flourish in the digital marketplace. We also need to acknowledge the incredible impact of creator voices to this campaign – thank you to all of the artists who spoke up with such passion and honesty,” says Graham Henderson, President and CEO of Music Canada. In 2017 Music Canada released The Value Gap: Its Origins, Impacts and a Made-in-Canada Approach. The first-of-its-kind report describes the Value Gap as “the significant disparity between the value of creative content that is accessed and enjoyed by consumers, and the revenues that are returned to the people and businesses who create it.” To protect the livelihoods of creators, businesses and cultures, creators and creative groups around the globe have been urging governments to enact legislative changes to ensure creators receive fair compensation for the use of their works. The European vote comes as the Canadian government is conducting its own review of the Copyright Act. Numerous stakeholders have raised the Value Gap as a key issue at the Standing Committee for Industry, Science and Technology, as well as the Standing Committee on Canadian Heritage’s study on Remuneration Models for Artists and Creative Industries. Additionally, through Focus On Creators, more than 3,700 creators have signed a letter urging the government to place creators at the heart of our country’s cultural policy. Music Canada is committed to continuing to work with the government of Canada throughout the review process to close the Value Gap here at home. On June 12, Music Canada’s President and CEO, Graham Henderson, appeared before the Standing Committee on Industry, Science and Technology (INDU) to provide testimony during the five-year statutory review of the Canadian Copyright Act. Henderson appeared before Standing Committee on Canadian Heritage two weeks prior to provide testimony on remuneration models for artists and creative industries. Below is the full-text of Henderson’s remarks before the INDU Committee. Good afternoon and thank you for the opportunity to testify to this committee on behalf of Music Canada. This committee’s review of the Copyright Act comes at a critical time for Canada’s creators. It is a time when governments around the world are questioning whether the current digital marketplace is functioning fairly for the world’s creators. The reality for music creators in Canada is that there are provisions in our own Copyright Act that are preventing them from receiving fair market value for their work. I believe the best way that this committee can assist in creating a marketplace that is transparent and supports Canadian creators is by providing the government with straightforward, accessible solutions to address the Value Gap. Music Canada produced a comprehensive report on the Value Gap in Canada which you will find in French and English in front of you. We define the Value Gap as “the significant disparity between the value of creative content that is accessed and enjoyed by consumers,” this is enormous, “and the revenues that are returned to the people and businesses who create it,” – it’s tiny. Today, more music is consumed than at any time in history. However, the remuneration for that content has not kept pace with the record levels of consumption. The same is true for digital video content, film and even journalism. The origins of the Value Gap extend back to more than twenty years ago. It was the dawning of the digital marketplace and countries around the world struggled to reinterpret copyright laws that were designed for an analog age. They wanted to protect creators, but they also wanted to give a boost to young technological startups and inevitably, perhaps understandably, mistakes were made. Around the world, lawmakers and policy analysts thought of the internet as a series of “dumb” pipes where your browsing habits were anonymous and the data travelling between sites was so vast it was unknowable. But twenty years later we know the internet is composed of the “smartest pipes” humankind has ever devised. Your web habits are meticulously tracked and the metadata that they generate is collected, analyzed and sold every second of the day, mostly without our consent or knowledge. While well-intentioned when they were created, the impact of these laws today is that wealth has been diverted from creators into the pockets of massive corporate entities, and what little is left over for creators is unfortunately concentrated into fewer and fewer hands. As a result, the creative middle class has virtually disappeared, and with it, numerous jobs, opportunities, and dreams. There is no need to point fingers. No one planned for the creative middle class to suffer. The important thing at this juncture is to move forward purposefully and without delay to get the rules right. You should make absolutely certain that Canada’s Copyright Act ensures a creator’s right to be fairly remunerated when their work is commercialized by others. The Value Gap is built on outdated safe harbour policies around the world. The announcement made last week by Ministers Bains and Joly that the Telecommunications Act and the Broadcasting Act will be reviewed, is an important step and in line with an international movement to find a solution to this problem. Safe harbours have been raised by other witnesses, and I hope that the committee will give significant consideration to addressing them. Since 1997, commercial radio stations have been exempted from paying royalties on their first $1.25 million of advertising revenue. It amounts to an $8 million annual cross-industry subsidy paid by artists and their recording industry partners to large, vertically-integrated and highly profitable media companies. The cost to creators since inception…$150 million dollars. Internationally, no other country has a similar subsidy, and the exemption does not apply for songwriters and publishers – meaning that performers and record labels are the only rights holders who are singled out to subsidize the commercial radio industry. This is unjustified and should be eliminated. The current definition of a “sound recording” in the Copyright Act excludes performers and record labels from receiving royalties for the use of their work in television and film soundtracks. This exception is unique to television and film soundtracks, and does not apply to composers, songwriters and music publishers. It is inequitable and unjustified, particularly in light of the profound role music plays in soundtracks, and it is costly to artists and record labels, who continue to subsidize those who exploit their recordings. The cost to creators? About $55 million dollars per year. The Act should be amended to remove this cross-subsidy. The term of copyright protection in Canada for the authors of musical works is out of line with international norms. Under the Copyright Act, protection for musical works subsists for the duration of the author’s life plus a further period of 50 years, and that is out of line with international standards. Years ago, a private copying levy had been created, originally intended to be technologically neutral. It has been limited by various decisions to media that are obsolete. This important source of earned income for over 100,000 music creators is now in jeopardy unless the regime is updated. Music creators are asking for the creation of an interim four-year fund of $40 million dollars. Each of these changes removes an unfair subsidy, harmonizes the laws within our industries, and brings us to international standards, and they can be done simply and they can be done today. This is an exciting time. As you review the Act, you have the opportunity to put creators at the heart of your policy making, ensuring that creators are paid every time their work is commercialized by others. 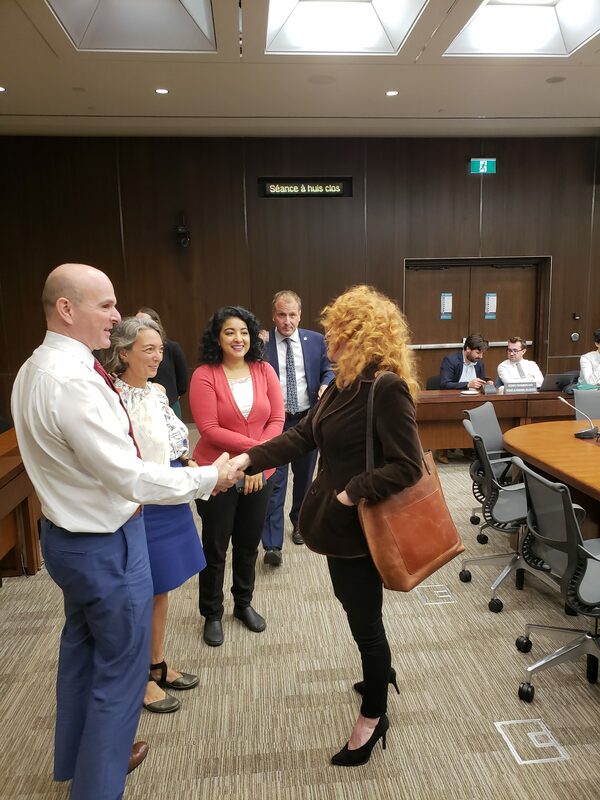 Earlier today Music Canada’s President and CEO, Graham Henderson, appeared before the Standing Committee on Canadian Heritage to provide testimony on remuneration models for artists and creative industries as part of the Copyright Act review. Below is the full-text of Henderson’s remarks. My name is Graham Henderson, and I am the President and CEO of Music Canada. We are a passionate advocate for music and those who create it. I am very pleased to see the Heritage Committee studying remuneration models for artists and creative industries. This is an aspect of the music industry ecosystem that I, and Music Canada, have for years been working to modernize. Creating a functioning marketplace where creators receive fair compensation for the use of their works forms the bedrock of our mission. But the reality for Canadian music creators is there are provisions in our own Copyright Act that prevent them from receiving fair market value for their work. Today, more music is consumed than at any time in history. However, the remuneration for that content has not kept pace with the record levels of consumption. The origins of the Value Gap extend back more than two decades to a time when countries around the world, including Canada, began adapting and interpreting laws created in another era to protect common carrier telephone companies in the then-dawning digital marketplace. Around the world those laws understood the internet as a series of “dumb” pipes where your browsing habits were anonymous and the data travelling between sites was so vast it was unknowable. But twenty years later we know the Internet is composed of the “smartest pipes” humankind has ever made. Your web habits are meticulously tracked and the metadata that it generates is collected, analyzed and sold every second of everyday. While well-intentioned when they were created, the impact of these laws today is that wealth has been diverted from creators into the pockets of massive digital intermediaries, and what little is left over for creators is concentrated into fewer and fewer hands. As a result, the creative middle class is disappearing, if it hasn’t disappeared already, and with it, numerous jobs and opportunities. The foundation of the Value Gap is outdated safe harbour policies and exceptions – all around the world. A safe harbour, by the way, is a way to limit the liability of an intermediary and allow music to be consumed without payment. I know that Ministers Joly and Bains are working on this issue and having conversations with their international counterparts to find a solution to this problem. Since 1997, commercial radio stations have been exempted from paying royalties on their first $1.25 million in advertising revenue. It amounts to an $8 million annual cross-industry subsidy paid by artists and their recording industry partners to large, vertically-integrated and highly profitable media companies. Internationally, no other country has a similar subsidy, and the exemption does not apply for songwriter and publisher royalties – meaning that performers and record labels are the only rights holders whose royalties are used to subsidize the commercial radio industry. The exemption is unjustified and should be eliminated. The current definition of a “sound recording” in the Copyright Act excludes performers and record labels from receiving royalties for the use of their work in television and film soundtracks. This exception is unique to television and film soundtracks, and does not apply to composers, songwriters and music publishers. It is inequitable and unjustified, particularly in light of the profound role music plays in soundtracks, and it is costly to artists and record labels, who continue to subsidize those who exploit their recordings to the tune of $55 million per year. The Act should be amended to remove this cross-subsidy. The term of copyright protection in Canada for the authors of musical works is out of line with international copyright norms. Under the Copyright Act, protection for musical works subsists for the duration of the author’s life plus a further period of 50 years. By contrast, the majority of Canada’s largest trading partners recognize longer copyright terms for musical works, and a general standard of the life of the author plus 70 years has emerged. I note that a vice-chair of this committee, Mr. Van Loan, introduced a Private Members bill on this issue and we thank you for your support. The private copying levy, originally intended to be technologically neutral, has been limited by various decisions to media that are effectively obsolete. This important source of earned income for over 100,000 music creators is now in jeopardy unless the regime is updated. Music creators are asking for the creation of an interim four-year fund of $40 million per year. This will ensure that music creators continue to receive fair compensation for private copies made until a more permanent, long-term solution can be enacted. Each of these changes removes an unfair subsidy, harmonizes the laws within our industries and brings us to international standards, and they can be done today. "Kinda Complicated" is now officially @ScottHelman's fourth track certified #GoldinCanada! It joins "PDA" as the second Gold-certified single from Helman's 2017 album Hôtel de Ville.